When it comes to investing in silver, there are a number of different options available to you in terms of size, shape, purity and weight. While most people choose silver coins and bars, there is another form of bullion that is equally worth considering, and that is the silver round. Silver rounds could be considered as a cross between a bar and a coin. They come in the shape and size of a coin, but like bars, have no face value and are not legal tender. They are simply a piece of silver bullion minted in the shape of a coin. 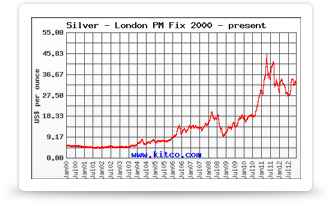 This makes silver rounds ideal for investors who (1) don’t want to make a large purchase, as is required when buying larger sized bars, and (2) aren’t interested in purchasing silver that can also be used as legal tender, as is the case with coins. 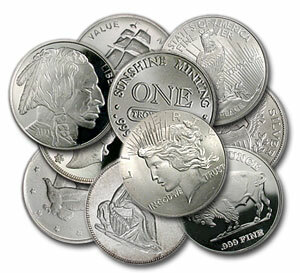 Many mints around the world produce silver rounds, as do some of the leading online precious metal retailers. This means there are lots of options available to those wishing to make this investment choice. When it comes to choosing which type of rounds to buy, some of the main criteria to choose from include what design you would prefer on the face of the round, and what size you would like it to be. As most silver rounds tend to be sold with a fineness of .999, the highest silver content possible, there is no need to worry about purity levels and silver content when choosing a product, although do make sure you double-check before ordering. While some products are sold on their own, others might come in a presentation box, in a capsule, or some other form of packaging. Whether you require these extras or not will influence your decision making process when selecting a round. 1 oz APMEX Silver Round .999 Fine: APMEX are one of the biggest online precious metal dealers and they have their own selection of rounds for sale. This is one of their popular products, which features the Apmex logo on one side, and the American eagle design on the other. It weighs one Troy ounce and is currently on sale for close to $31, which is a few dollars less than a legal tender American Eagle silver dollar coin. 2 oz Year of the Snake Silver Round .999 Fine: this is a two ounce round so is twice the size of the above product. This product was made to commemorate the start of the Chinese Year of the Snake, which is reflected in the chosen design and markings of this round. This product is also available in a 5 oz. and a 10 oz. version. 1 oz 1804 Silver Dollar Design Silver Round .999 Fine: despite the name, this product isn’t legal tender and is not a coin. It is a round that has been produced to commemorate the original American dollar coin from 1804, said to be one of the rarest coins in the world. It too retails for around $31. As you can see these rounds come in a range of designs and sizes. While they don’t cost much less than legal tender dollars per round, if you were buying them in bulk, you could make some considerable savings. Some silver rounds can be placed in your Individual Retirement Account (IRA) to help you plan for the future, and diversify your portfolio. As not all products are eligible, make sure you research your choices properly, to find out if they are eligible or not, if this is important to you.